Cauliflower Au Gratin is a cozy little side casserole that’s perfect comfort food if you’re facing that big scary snow thing coming up. (The forecast isn’t looking good.) We had the Cauliflower Au Gratin at Thanksgiving and it was a huge hit at our house, but it would be great for Christmas or Easter or just any old day, maybe as a side for ham or pork chops. And why not serve as a lower carb option as a side for a steak dinner? For some reason, I almost always think of dishes that are creamy and cheesy like this Cauliflower Au Gratin as holiday fare. I don’t know why in particular. Maybe it’s because I don’t always give side dishes like veggies a lot of love during our every day in and day out dinners. Too often, it’s a veggie that’s steamed or microwaved. This simple recipe gives your old standard cauliflower some love, for sure. And while it looks (and tastes) absolutely decadent and is perfect for a holiday or special occasion, it’s not too over the top for a weekday. It’s not too complicated, either, and it’s a great lower carb option at the dinner table. And while I’m presenting Cauliflower Au Gratin as a side dish, if you have any leftover ham, cube some up and toss it in for a quickie leftover ham meal. It’s a great alternative to Scalloped Potatoes & Ham. And of course, if you’d like another variation, you can add a little of America’s favorite condiment, bacon. Just sayin! Everyone at our house loved this Cauliflower Au Gratin although I admittedly overcooked the cauliflower. Yep, even food bloggers mess up – and maybe even more than normal people (coz I’ve never met a food blogger that’s normal, lol!) because we’re always trying and/or developing new recipes. Watch your cauliflower closely and be sure to remove it from the water while it’s only just cooked through and not totally soft already. If you give a couple of the florets a poke with a knife, there should be just a little resistance. Cauliflower Au Gratin relies on a white sauce, and that’s something I’ve been making since I was a kid, in one form or another. It’s pretty simple but the key is to make sure the flour loses it’s “raw” taste as it cooks for a minute or two in the butter and then the milk needs to be added in small additions at first, whisking like mad, until the sauce is liquidy enough to dump in the rest. I have a whole page dedicated to White Sauces & What to Do with them if this is new to you. And there are troubleshooting hints at the bottom of that page if you need any. Cauliflower Au Gratin is pretty riffable. It’s easy to double if you need more. And yes, you can add more cheese if you want. IMHO more cheese is just never wrong! As I mentioned above, turn it into a main meal with a little ham. If you want to dress it up more, sprinkle with a little cooked bacon. You can also top Cauliflower Au Gratin with an herby Breadcrumb Topping, too, although I think it is perfect just as is. We’re paying through the nose, it seems, for cauliflower these days. When something gets popular and demand increases, the cost often rises. And cauliflower has been so popular, lately. Boy, I wouldn’t have predicted that 20 years ago! Anyway, if you have an Aldi, you’ll find it at the best price there. If cauliflower is on sale, be sure to figure out if the cost is by the head and buy the largest. If priced by the pound, weigh it on a scale so there won’t be a huge surprise at the checkout. Shop well for that cheese. Watch the grocery store specials and coupon deals; grocery store cheeses keep for weeks, unopened and can be frozen. Once it’s frozen, though, it gets crumbly and not so good for just eating or snacking on, but works fine in casseroles like this. Buy it when it’s cheap and use it as needed. Cauliflower au Gratin; this was a hit at Thanksgiving with our ham. 3/4 cup good quality Cheddar, white or standard plus two or three tablespoons to top the casserole, if desired. Bring a large pot of water to boil and cook cauliflower until just barely tender, about four minutes. Drain thoroughly and place into a medium-sized casserole. Melt butter in a medium-sized saucepan over medium-high heat. Add flour and whisk a minute or two until flour starts to look a little dry but hasn’t picked up any color. Whisk in milk, bring to a boil and stir until thickened enough to coat the back of a spoon and not fill in the line when a finger is run across it. Remove from heat and add cheese, in small handfuls, stirring after each until incorporated. Add most of the thyme, salt, and pepper. Pour the sauce over the cauliflower, using a spoon to nudge between florets, if necessary, so all are coated. If desired, top with a little additional cheese and sprinkle the top with a pinch of the thyme. Bake for 20 minutes or until lightly browned in spots. This entry was posted in Click here for Bargain Meals, Click here for Fabulous Food Posts and tagged au gratin, Cauliflower, cheddar, Cheese, hearty sides, milk, Side, Vegetable Side, White sauce. Bookmark the permalink. This is now on the short list of possibilities for my Christmas Eve dinner side dish contributions! That’s great you’re getting an Aldi! When the one in Sioux Falls went in, it was pretty rough for the first few weeks – lots of boxes and bad veggies, then it got going and was fine. I don’t guess that’s probably the case with all Aldi stores but thought I’d mention it, just in case! My grandmother used to make all kinds of vegetable dishes like this, although I don’t think she used cauliflower in one. The cauliflower and sauce are like a perfect marriage! I thought it was perfect when I found it! Lucky you on the pricing! I do love roasted cauliflower – magical! And this is a great dish for Christmas and has a bit of heft to it, too! 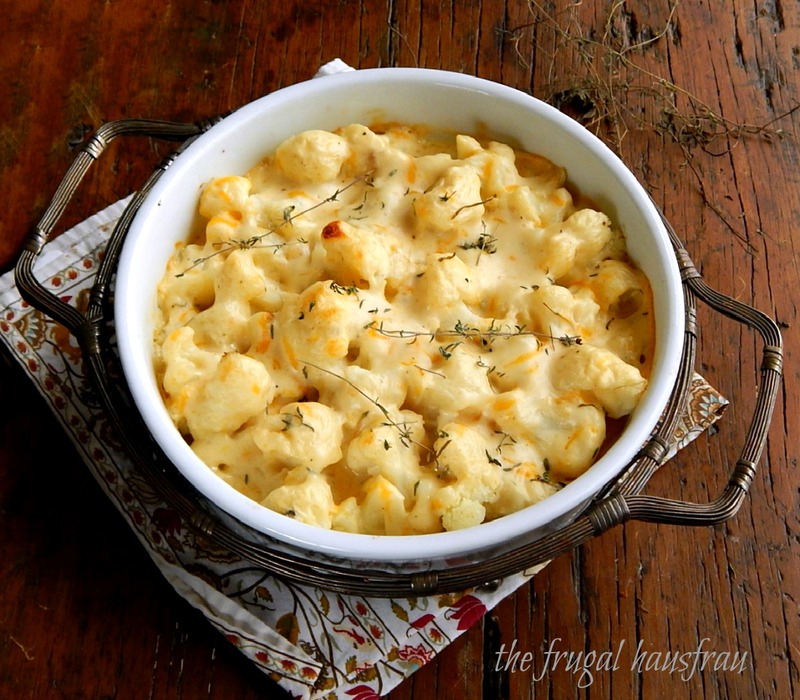 Cauliflower & Cheese – a match made in heaven! But off season doesn’t really explain the price…Cauliflower has always been one of those veggies that was pretty cheap all year long. I did some checking and it seems that the demand is actually a little lower for cauliflower right now and areas of Texas and Arizona are holding back harvests. Anyway, I still love it! And yes, I miss the summer markets! Thanks Sandhya! It was good. Funny but it’s just the kind of thing I would have hated as a child! I actually bought a cauliflower yesterday while grocery shopping I was not sure what to do with it, so this looks ideal. Kind of the same method I used to make homemade mac and cheese so I’m sure it’s going to taste delicious. Thanks for the inspiration and another great recipe. This would actually be really good with your Italian stuffed meatloaf from an earlier post. I think I might try and make them together. I’ll report back. Sounds like a plan, lol!!! I HAVE to make that meatloaf again. Guess I’ll have to (I mean get to, haha) invite the kids over for dinner to help eat it. It looks tasty! I still haven’t tried cauliflower as a replacement for potato or rice. I really must! I do like the cauliflower rice but I haven’t gone so far as to make cauliflower pizza crust! I’ve seen posts from a few who have. It’s intriguing, and I must say it’s probably faster to make than mixing up a yeast dough from scratch. I may try it one day…. I might , too. But gosh if you’re gonna have pizza, have pizza – unless you’re allergic! O K that was blunt, lol! But I’m sticking by it!! When 2 bundles of broccoli cost 99 cents, I’m disinclined to buy cauliflower. Though that cheesy gratin does look tasty. We have similar issues with price here too. Especially in comparison with the potatoes or rice. But when I can afford to get it, both broccoli and cauliflower are favourites in our house. I’ve only cooked cauliflower a few times but broccoli is a perennial favourite. This would be great with broccoli, too! K.R. from another foodie blogger is so right – both cauliflower and broccoli used be be super cheap, here. Cabbage, too. Now the prices have risen so much due to popularity. They’re all so good for you, the cruciferous veggies! I’m glad I’m not the only one who’s realized how expensive cauliflower has gotten. It used to be a cheapo veggie that nobody wanted! My jaw about hit the floor when I bought a head of it a couple of weeks ago, and it cost almost five bucks!!! 😮 However, I do love cauliflower and cheese together, I make a version with a mushroom cheese sauce with a wee bit of mustard to pour over it. This looks simple and quite delicious! I know it is CRAZY!! The head I got at Aldi was very reasonable (I know that doesn’t help you, though, sorry!) but I was just getting ready to put cauliflower in my cart at HyVee when I noticed it was $4.99!!! I’d love to see yours with the mushroom cream sauce!! Sounds wonderful!